The South African Forum of Civil Engineering Contractors (SAFCEC) invites interested Enterprise Development Facilitators to submit proposals for the development and facilitation of an enterprise development programme to assist SAFCEC in providing Enterprise Development as a support service to its members. This programme is aimed at emerging contractors in the civil construction industry that are referred to as Qualifying Beneficiary Entities in the Revised Construction Sector Code. The intention is that the programme will be managed by SAFCEC to assist its member organisations in meeting BBBEE targets and specific client requirements. Each programme will have individual agreements in place between SAFCEC, the facilitating entity, the developing entity, and the established entity. The established entity will be responsible for implementing the needs outlined in the development plan - either directly (internally) or through covering all costs associated with the provision of external mentors/specialists in specific fields. 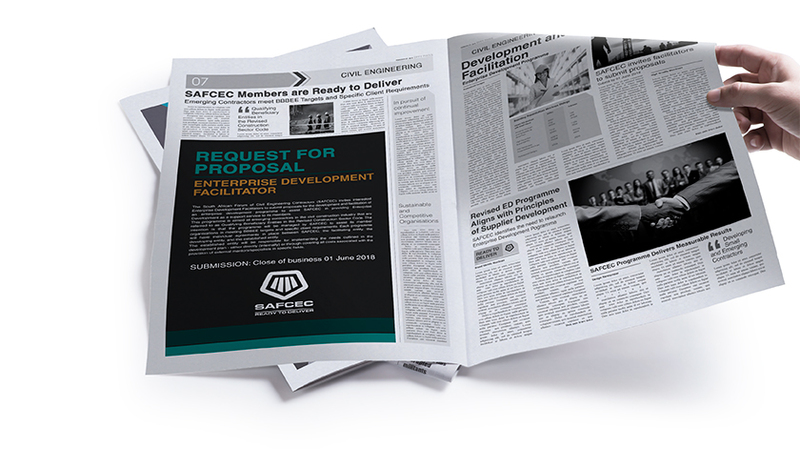 SAFCEC’s current Enterprise Development programme was developed for its members more than 10 years ago. In pursuit of continual improvement and service delivery to its members, SAFCEC has identified the need to relaunch the programme to ensure that the delivery thereof is not only professional and practical, but one that delivers measurable results. The objective is to develop small and / or emerging companies operating in the civil construction industry into sustainable and competitive organisations within their sector. The newly amended Construction Codes of 2017 subscribe to the principle of Supplier Development. The revised Enterprise Development programme must align to the relevant principles of Supplier Development in the revised code. Include details of how the programme would be presented, documented, recorded and steps to ensure successful implementation. The structure should consider the national membership of SAFCEC. Details should be provided regarding the capacity of the entity, as well as the number of Enterprise Development initiatives that could be managed concurrently. Proposed costing and/or funding of the development of the revised programme. Proposed costing of Facilitation including provision of mentors and specialists. Details of mentors and specialists that are available to develop specific needs in the organisation. Details on how the programme would be facilitated including roles and responsibilities. Indicate the frequency of meetings, interactions, and types of training to be provided. The proposal should indicate steps to be followed should the outcomes not be achieved. Set tasks for future development with reference to Individual development plans, including any gaps in knowledge that might have been identified. Each Respondent is responsible for labeling the exterior of the sealed envelope containing the proposal response, proposal name, proposal due date and time, and your firm’s name.